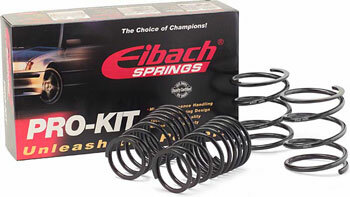 Eibach's Pro-Kit lowers your E46 M3's center of gravity, reducing squat during acceleration, body roll in corners and excessive nose-dive under braking. Eibach's Pro-Kit also reduces the excessive fender-well clearance that makes the M3 look 'lifted up' so your E46s looks just as hot as it performs. A tasetfull drop of 0.6" Front 0.9" Rear looks classy, while matching well with factory or aftermarket shocks. Feel free to add Eibach's Sway bar set for even more control in the twisty corners with no loss in ride quality.